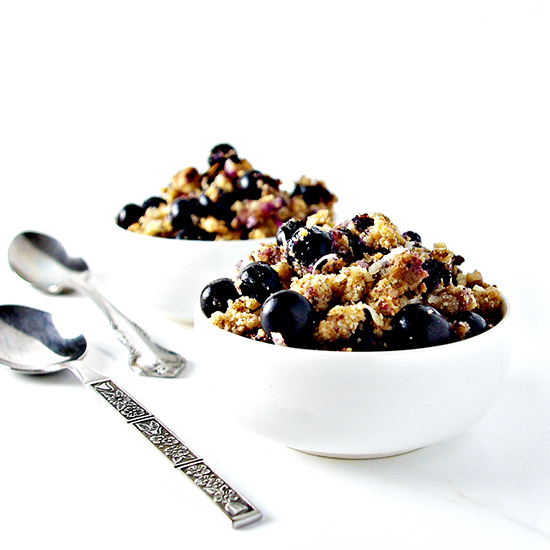 If this Grain-Free Blueberry Crumble isn’t one of the best ways to welcome fall into our lives, then I don’t know what is. Instead of boasting a super-sweet flavor, this breakfast/dessert/just because recipe is all things spice. Specifically, cinnamon and nutmeg. And I’m undone. So freaking good. There’s no other way to slice and dice it. 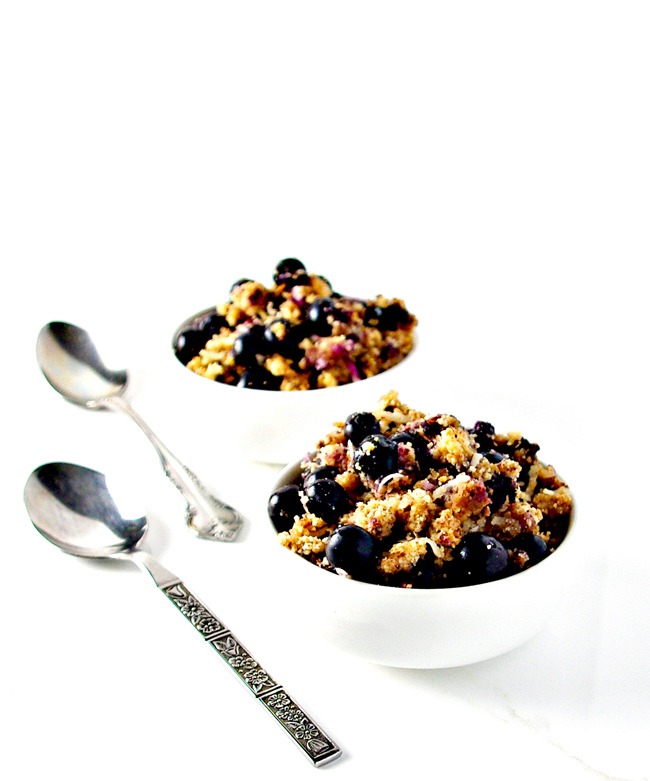 I’m also going to just throw this out here: if your tooth is a little sweeter than mine is, then instead of adding more sweetener, top your Grain-Free Blueberry Crumble with coconut cream, whipped cream, or ice cream. Any and all of those would simply be amazing. Like, next-level amazing. As in, I might just become an early morning person for this. 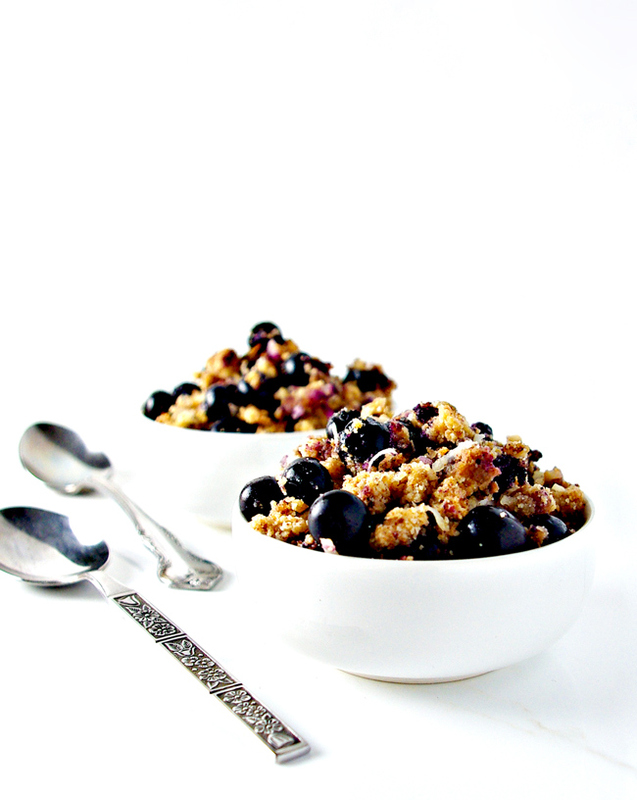 Grain-Free Blueberry Crumble is all things fall comfort food, and it pairs with coffee like Fred and Ginger, Tony and Ziva, or Detective Murdoch and Dr. Ogden. This recipe is how I do Saturday mornings now. It’s the snack treat I’m grabbing when I want to curl up with a good book and a blanket. Speaking of which, can we just take a moment to give a shoutout to Mother Nature and these cooler temps? I don’t quite know how to explain it, but I don’t have a single favorite season. Instead, I think I like having seasons. I’m not sure I’d do well in a climate that never changed because after about three months I’m as bored with my summer shorts as I am my winter coat. I fully operate under the assumption that because a season has changed I will breathe anew. I WILL become productive, I WILL achieve new goals, and I WILL NOT hit snooze just one more time. Crumbles, so it’s best served in a bowl. Doesn’t boast a sweet flavor – this one is definitely spice driven. Is gluten-free, grain-free, dairy-free, soy-free, vegan, and paleo. Three out of four of us in the family LOVED it. I made this several times to get just the right balance of baking times, and I found that about 25 minutes did the trick. But more on that in a minute. In the meantime, no one was at all sad about this multiple batch business. Even Toodle, who wasn’t totally sold on the spice-over-sweet ratio, kept coming back for just one more nibble. As for baking times, this one is going to be personal preference, so let’s talk preferences. I bake my Grain-Free Blueberry Crumble for about 15 minutes uncovered and another 10 minutes loosely covered with foil. 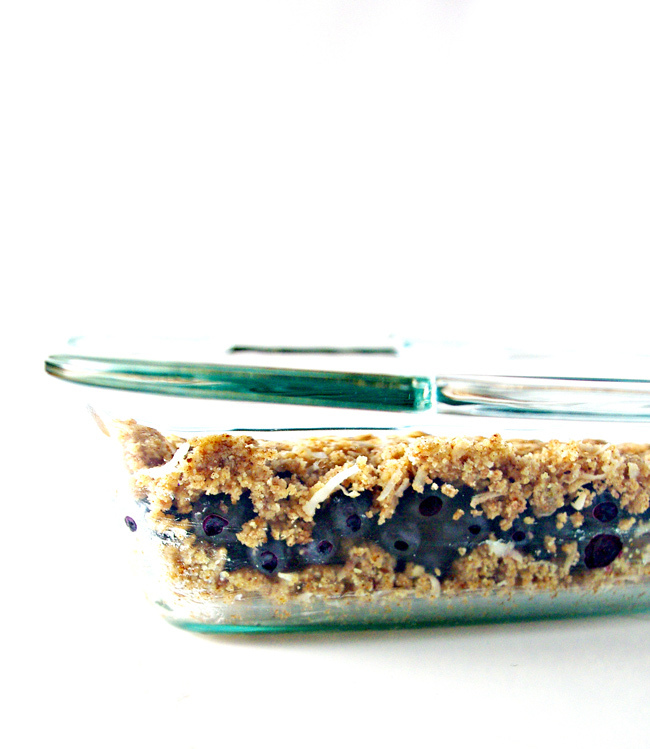 You can bake longer, checking every 1-2 minutes, if you like more crisp with your crumble. Since I’m someone who prefers the batter over the cookie, I tend to err on the side of just slightly under-baked. But again, this is totally up to you. And while you can store this in the fridge for a few days, I highly suggest serving it immediately, especially with a cup of coffee or topped with ice cream, coconut cream, whipped cream, or some other melty topping of choice. And there you have it, Spiriteds, a recipe to add spice to your Saturday mornings! 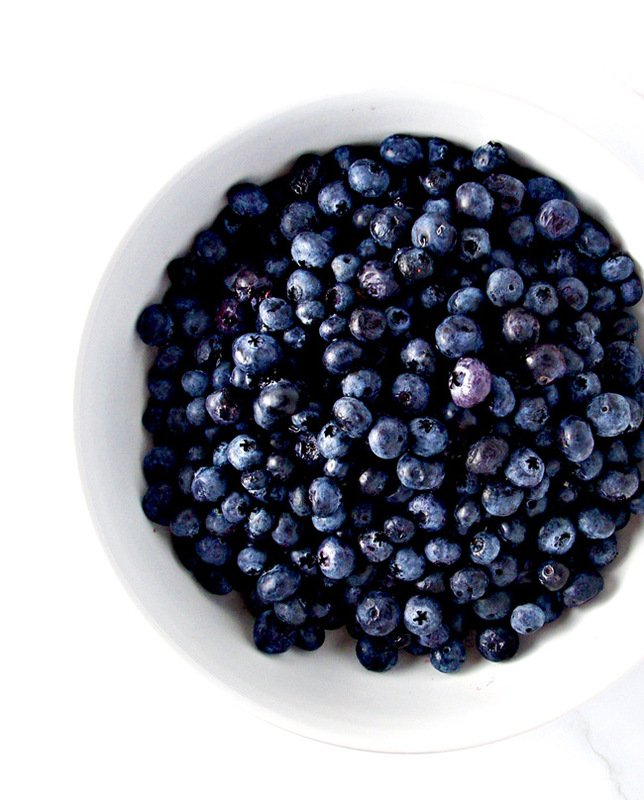 In a mixing bowl, combine blueberries, lemon juice, 1 tablespoon almond flour, and 1 tablespoon coconut sugar. Set aside. 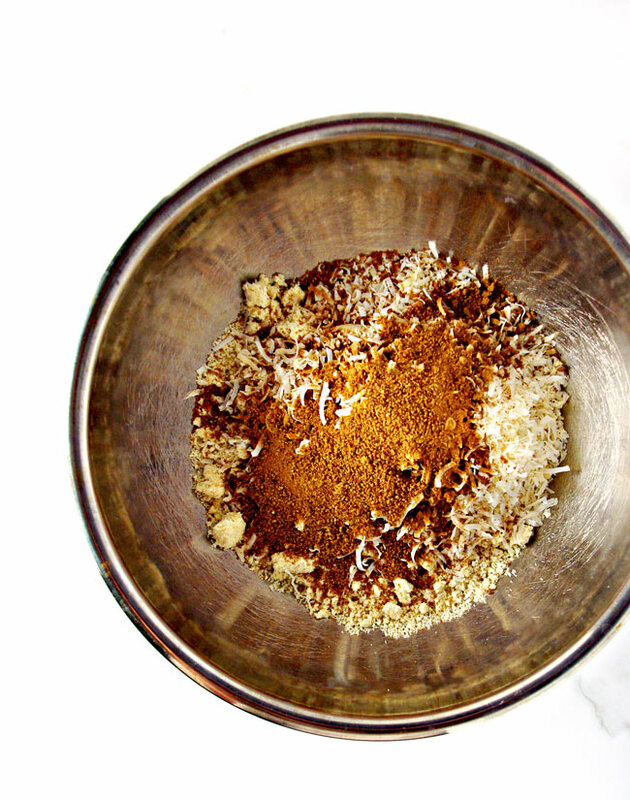 In another mixing bowl, combine remaining almond flour, remaining coconut sugar, cinnamon, nutmeg, sea salt, and chopped nuts or shredded coconut. Pour in melted coconut oil and maple syrup. Stir until combined. Grease an 8×8 glass baking dish. Scoop approximately half the mixture into the dish and gently pat into place. Pour blueberry mixture over the top and then top blueberries with remaining mixture. Bake for about 15-17 minutes uncovered. Then bake about another 10 minutes loosely covered with foil. Serve immediately in small dishes and top with desired add-ons. Store in the refrigerator for about 2 days.